There is more than a little irony in Israeli prime minister Benjamin Netanyahu’s decision to attend a “celebration” dinner this week in London with his British counterpart, Theresa May, marking the centenary of the Balfour Declaration. Palestinian objections to the 1917 document are well-known. Britain’s Lord Balfour had no right to promise a “national home for the Jewish people” in Palestine, on the land of another people. But Israelis have been taught a different history in which they, not the Palestinians, were betrayed. In 1939, Britain appeared to revoke its pledge, stating “unequivocally” that it would not establish a Jewish state in Palestine. Limits on Jewish immigration were imposed, at a time when Europe’s Jews were fleeing the Nazi Holocaust. It was for this reason that nearly a quarter of a century ago, in his book A Place Among the Nations, Mr Netanyahu accused Britain of perfidy. One can understand the reluctance of Israelis today to concede the pivotal role provided by Britain. The Balfour Declaration is an embarrassing reminder that a Jewish state was the fruit of a transparently colonial project. In fact, Britain assisted the Zionists as best it could, given the need to weigh its imperial interests. 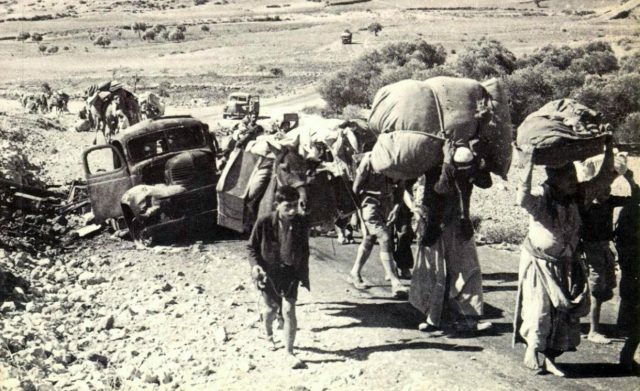 Restrictions on immigration were introduced under the severe strain of a three-year armed uprising by Palestinians, determined to prevent their country being given away. Historian Rashid Khalidi has noted that the Palestinian revolt of the late 1930s included possibly the longest-ever anti-colonial general strike. It posed such a threat that Britain committed thousands of extra soldiers to repress the insurgency, even as war loomed in Europe. By the time Britain departed Palestine in 1948, it had overseen three decades in which the Zionists were allowed to develop the institutions of statehood: a government-in-waiting, the Jewish Agency; a proto-army in the Haganah; and a land and settlement division known as the Jewish National Fund. By contrast, any signs of Palestinian nationalism, let alone nation-building, were ruthlessly crushed. By the end of the Arab revolt, less than a decade before the Palestinians would face a Zionist campaign of ethnic cleansing, Palestinian society lay in ruins. Israel learnt two lessons from Britain that guided its subsequent struggle to quash Palestinian attempts at liberation. First, Israel continued the draconian measures of British colonial rule. In the early 1950s, Menachem Begin, leader of the pre-state Irgun militia and a future Israeli prime minister, had famously called Britain’s emergency regulations “Nazi laws”. Nonetheless, they were incorporated into the military orders Israel uses against Palestinians under occupation. Significantly, the regulations are also still in force inside Israel against the country’s large minority of Palestinian citizens, one in five of the population. Israel has yet to end its seven-decade state of emergency. The other lesson derives from the wording of the Balfour Declaration. It referred to the native Palestinians – then 90 per cent of Palestine’s inhabitants – as “existing non-Jewish communities”. It promised only to protect their “civil and religious rights”, denying them recognition as a nation deserving of political and social rights. Israel followed suit. Palestinians in Israel were characterised as “the minorities”, or generic “Israeli Arabs”, rather than Palestinians. Israel’s perverse nationality laws assign them largely religious classifications as Druze, Arameans (Christians) and Arabs (increasingly synonymous with Muslims). In occupied East Jersualem, Palestinians are denied all national and institutional representation. And in the West Bank, the powers of the Palestinian Authority – supposedly the Palestinians’ fledgling government – extend no further than acting as a security contractor for Israel and carrying out municipal services like garbage collection. In practice, the PA’s severely circumscribed authority is confined to a tiny fraction of the West Bank. As a result, the Palestinians’ national ambitions have shrunk precipitously: from Yasser Arafat’s struggle for one secular democratic state in all Palestine, to today’s enclaves in Gaza and slivers of the West Bank. Israel has consistently rejected for Palestinians the very self-determination it once demanded from the British. Mr Netanyahu’s government is preparing this week to nullify any lingering hopes of Palestinian statehood with the most significant move towards annexation of Palestinian territory in 40 years, when Jerusalem was annexed. The plan is to greatly expand Jerusalem’s boundaries to include large Jewish settlements in the West Bank like Maale Adumim. In addition, Mr Netanyahu has reportedly promised $230 million to build five highways in the West Bank, aiding movement between Israel and the settlements. Is there an opposition? Avi Gabbay, new leader of the centre-left Zionist Union, sounds no different from the far-right. This month he stated: “I believe all of the Land of Israel [historic Palestine] is ours.” No West Bank settlement would be evacuated, even for the sake of peace, he added. Britain fulfilled its promise to the Zionists in full, but broke even its feeble commitment to the Palestinians to protect their civil and religious rights. An apology from Britain is long overdue, as are efforts to repair the damage it initiated 100 years ago.